With aging infrastructure becoming an increasing concern in many communities, more attention is being focused on the maintenance of building facades. Under the right conditions, thermal imaging can detect evidence of delaminated stucco or concrete finishes on the exterior of masonry buildings. Over time, buildings that utilize concrete stucco for exterior finishes are subject to failure. One of these failures involves the stucco delaminating from its substrate. Delaminated stucco is a serious safety concern as it can cause serious injury to pedestrians should it fall from any significant height. When concrete stucco delaminates from its substrate, an air pocket is formed between the stucco finish and the substrate. Because this air pocket acts as an insulator, it will change the thermal capacity and/or thermal conductivity in the area of the delamination. 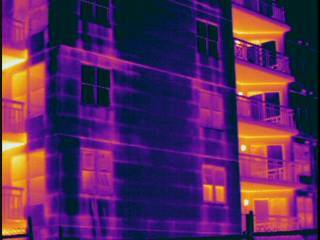 Under the correct weather conditions, thermal imaging can detect evidence of delaminated areas. In order to detect evidence of delaminated areas using thermal imaging, a temperature differential must be present. Typically, infrared inspections of concrete stucco are performed during evening hours following a sunny day. As an alternative, infrared inspections may also be performed during midday under solar loading conditions. Thermal patterns associated with delaminated stucco will generally be amorphous in shape and will typically appear as cold spots during post-sunset inspections or as hot spots during midday inspections. Once the infrared inspection has been completed, all thermal anomalies should be investigated for cause and appropriate corrective measures taken. Despite unseasonably warm weather this winter, severe weather and its attendant challenges are likely to occur before this season ends. With this Tip, we offer some advice for driving in winter conditions. Lastly, be certain to wear your seat belt. Consult your local weather forecast before you set out and consider postponing your trip if extreme weather is predicted. Confusion can arise with alphabetical or numerical labels particularly when switchgear enclosures are inspected from different perspectives e.g. front versus rear. Further confusion can occur when phase rotation has been modified or changed or, in some cases, mislabelled. Reference errors can be avoided by using terms that cannot be confused such as Left, Middle, Right OR Upper, Middle, Lower. When using such terms, one should always reference where the image was taken from. For outside power lines references such as Street, Center, and Field may be used to identify phases without confusion. Infrared inspection of electrical distribution systems is one of the many applications covered in the Infraspection Institute Level I Certified Infrared Thermographer® training course. For course schedules or to obtain a copy of the Standard for Infrared Inspection of Electrical Systems and Rotating Equipment, visit Infraspection Institute online at www.infraspection.com or call us at 609-239-4788. Seasoned professionals know the value of spare parts when it comes to facility maintenance. The principle of always being prepared can be successfully applied to an infrared inspection program as well. 1. Examine your equipment for parts that are subject to physical wear such as eyepieces, switch covers or hand/neck straps. 2. Identify which parts are fragile and are most likely to break such as viewfinders or external monitors. 3. Determine which items are critical to operation such as power/video cables, batteries, fuses, screws and external hardware. 4. Inventory items which are easily misplaced such as lens caps and flash cards. 5. Purchase necessary items as soon as possible to ensure availability of specialty or custom parts. For critical items, be sure to purchase extras. 6. Replace spare parts when utilized to maintain inventory. After building your spare parts inventory, keep mission-critical components in a safe place or with your imager so that you will have them when needed. Infrared imager operation and maintenance are two of the many applications covered in the Infraspection Institute Level I Certified Infrared Thermographer® training course. For more information or to register for a course visit us online at www.infraspection.com or call us at 609-239-4788. The benefits of thermography for condition assessment of insulated roofs are well documented. Performed on a regular basis, infrared thermography can help to extend the overall life of a roofing system when utilized as part of a preventive maintenance program. As a building component, roofing systems tend to be out-of-sight and out-of-mind. Despite the critical role they play in keeping a facility dry, many roofs garner little attention until they begin to leak. In order to minimize damage, it is imperative that roof leaks be detected and repaired at an early stage. Many roofs can gain significant quantities of moisture in a very short period of time. In the case of retrofitted roof systems, whole roof sections can become saturated in a matter of weeks while leaking little or no water into the occupied spaces. By the time a roof leak is noticed within the building, replacement may be the only option available. For best results, insulated roofs should be thermographically inspected at least twice per year (e.g. Spring and Autumn) in accordance with published standards and guidelines. Semi-annual infrared inspections can help to identify new areas of moisture damage and help to ensure that recent repairs are performing in a watertight manner. Infrared findings should be correlated with a thorough visual inspection and other pertinent data to formulate an effective roof maintenance strategy. For information on infrared training or certification or to obtain a copy of the Guideline for Performing Infrared Inspections of Building Envelopes and Insulated Roofs, contact Infraspection Institute at 609-239-4788. As thermography has gained in popularity, the demand for training services has also increased. Since operator training can have a profound effect on the success of an infrared program, obtaining quality training is of paramount importance. At present, there are several firms that offer infrared training and certification. While nearly all infrared training firms refer to their training courses by level (1, 2, or 3), there are no standards which dictate the content of any offered course. As a result, training courses can vary widely between firms. Lastly, beware of claims that training is “vendor neutral”. It is impossible for training firms to sell infrared equipment or train for equipment manufacturers without being biased. Firms who train for manufacturers work for manufacturers and cannot provide the unbiased information students deserve. Simply put, no man can serve two masters. Infraspection Institute has been providing infrared training and certification for infrared thermographers since 1980. Our Level I, II, and III Certified Infrared Thermographer® training courses meet the training requirements for NDT personnel in accordance with the ASNT document, SNT-TC-1A. All courses are taught by practicing, expert Level III thermographers whose field experience is unsurpassed anywhere in the world. We teach effective, real-world solutions using the latest standards, software and technology. For more information call 609-239-4788 or visit us online at www.infraspection.com. Resolution is one of the most important objective specifications for any thermal imaging system. Pixel count is frequently offered as a measure of image quality; however, pixel count is only one of many factors that affect imager resolution. The Focal Plane Array (FPA) detector assemblies used in modern infrared imagers are made up of several tiny, discrete picture elements or pixels. Each pixel is a discrete infrared detector that collects thermal data. Individual pixels are arranged to form an array that ultimately allows the imager to produce a thermal image. FPA detectors are commonly specified according to pixel count and ratio. Typical detector sizes for industrial imagers range from 160W by 120H to 320W by 240H; some detectors may have more or less pixels. To determine the total pixel count for a detector; the horizontal and vertical values are multiplied. Imager manufacturers often cite pixel count as a measure of imager resolution. Imager sales are won and lost as entire ad campaigns focus heavily on this single objective specification. Actually determining resolution is not that simple. Although resolution generally increases with the number of pixels, there are several other factors that influence image clarity or resolution. These include, but are not limited to, pixel viewing angle, imager optics, signal-to-noise ratio and the imager’s display screen. When evaluating an imager for resolution, physically try the imager under actual working conditions. Imagers that produce clear images should be sufficient to the task regardless of pixel count. To better understand imager resolution, read the article, Selecting, Specifying and Purchasing Thermal Imagers available from Infraspection Institute. To obtain a copy of the article, call 609-239-4788 or visit us online at www.infraspection.com. 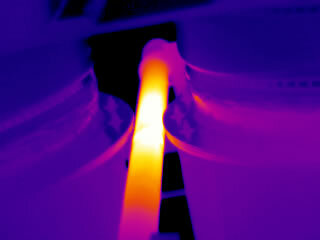 The magnitude and intensity of inductive heating should not be underestimated when performing infrared inspections of electrical switchgear. Inductive heating is derived from the proximal interaction of non-current carrying devices with the magnetic field around energized conductors that are under load. Inductive heating affects ferrous metals and causes inexplicable heating of non-current carrying components. The intensity of heating is a function of the amount of current passing through the conductor and rather than the voltage class. In some cases, the affected components can reach temperatures in excess of several hundred degrees. 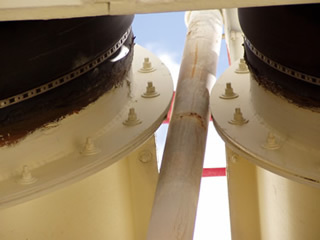 During a recent inspection at a power generation plant, two examples of inductive heating where observed near the plant’s step-up transformers. Images captured showed intense heating on a non-current carrying support pole and bus transition box, both of which were close to iso-phase bus entering a13kV to 230kV step-up transformer. Temperatures documented on these devices were in excess of 400°F. Being the starting point of transmission service, a heavy current load would be expected on energized equipment. Often, engineering designs on switchgear enclosures and other electrical equipment do not take into consideration the interaction of non-current carrying ferrous devices within electro-magnetic fields. In some cases, these situations can pose safety hazards when the affected component is in contact with combustible materials or heats structures that are accessible to human contact. When faced with perplexing heat patterns on components that should not be hot, inductive heating may be to blame. “Watch Your Step”. Sage advice that we’ve heard a million times; however, falls continue to be one of the most common workplace accidents. Following a few simple steps can help thermographers to prevent most falls. Lastly, be sure to use sturdy footwear appropriate to the task. Work boots and shoes should be laced and tied to prevent tripping and to afford proper support. When it comes to fall protection, an ounce of prevention is worth a pound of cure. For more information on workplace safety standards and fall protection, visit www.osha.gov. “What’s in a name? That which we call a rose by any other word would smell as sweet.” This Shakespeare quote implies that names are not that important; however, Sir William never had a website. In this Tip we discuss the importance of website domain names. When setting up a website, choosing a domain name is one of the most important considerations. A domain name not only represents your online identity, it can seriously influence the success of marketing a company and its products and services. Prior to selecting a domain name, it is important to understand the short and long-term implications of domain name choice. A general rule of thumb for domain names is www.yourcompanyname.com. This convention works well if your company name is recognized and/or unique. This can get tricky if your company name is long or contains characters such as hyphens. Domain names can only use letters, numbers, or dashes; spaces and symbols are not allowed. Lastly, be certain to renew domain name registrations on time to avoid loosing your ownership. Expired domain names that are not trademarked can be purchased by a third party and used to point traffic to websites of their choice. Designing and maintaining an effective website is one of the many topics covered in the Infraspection Institute Level III Best Practices training course. For more information on thermographer training and certification or to register for a course, visit us online at www.infraspection.com or call us at 609-239-4788. On September 5, 2008, the eighth edition of NFPA 70E Standard for Electrical Safety in the Workplace became available superceding all previous editions. This latest edition of NFPA 70E contains several important changes and specifically addresses thermographic inspections of energized electrical systems. Since 1979, the National Fire Protection Association has published the document, NFPA 70E. Since its initial publication, this safety standard has been renamed, expanded, and extensively revised. NFPA 70E is applicable to any workplace and is intended for use by employers, employees, and OSHA, among others. Perhaps the most significant change to NFPA 70E is that thermography is specifically addressed as a task. Table 130.7(C)(9) Hazard Risk Category Classifications provides Hazard/Risk categories ranging from 0 to 3 depending upon the type of equipment being inspected. While Table 130.7(C)(9) may be used for certain tasks, it does not cover all inspection scenarios. For tasks not listed in Table 130.7(C)(9) or for power systems with greater than the assumed maximum short circuit current capacity or with longer than the assumed maximum fault clearing times, an arc flash hazard analysis is required. The application and use of NFPA 70E are specifically covered within Infraspection Institute’s online short course, NFPA 70E – Are You in Compliance? Available 24 hours per day, this 45 minute course focuses on the history and application of 70E, changes included in the current edition, and how it applies to thermographers. For more information or to register, please visit: http://www.successiries.com/SuccessIRies_105.html. 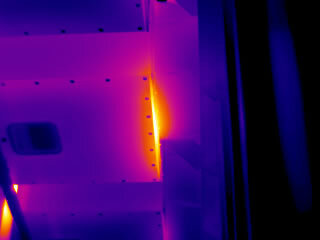 Infrared imaging can be useful for detecting leaks within building sidewalls; however, timing an inspection can be tricky. Controlled wetting of walls can be used to simulate storm conditions during an inspection. 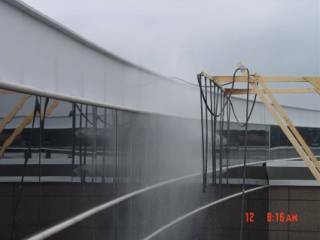 Water spray racks are mechanical devices that permit controlled wetting of a building surface. Spray racks typically consist of lightweight tubing and engineered spray heads spaced at regular intervals. 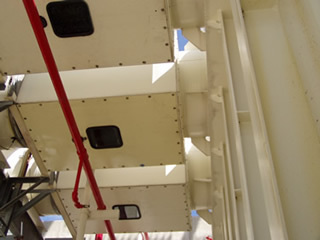 When connected to a water supply and placed in front of a building wall, a spray rack can be used to deliver a deluge of water to an area of interest. The amount of water delivered can be controlled by using different size spray heads and/or varying supplied water pressure. Spray racks are commonly used for testing the water tightness of curtain walls. During an infrared inspection from the interior of a building, spray racks can provide continuous wetting of walls to aid in leak detection. Spray racks can also be used to uniformly saturate a wall when infrared inspections are to be performed at a later time to detect evidence of latent moisture. Recent advancements in technology are reshaping traditional approaches to education. Students are now able to study a wide variety of subjects, including thermography, from virtually anywhere in the world. Distance learning may be defined as any situation where the student and the instructor are in physically separate locations. Distance instruction may be live or pre-recorded and can be delivered via video presentations, remote teleconferencing, and web-based presentations. Distance learning provides several advantages over the traditional classroom setting. Chief among these are the elimination of travel costs, 24 hour availability, and increased convenience in scheduling. The availability of Distance Learning courses for thermography is particularly beneficial to thermographers with hectic schedules. Infraspection Institute offers a wide variety of Distance Learning courses for thermography. Courses include: Certification Prep, Applications and Industry-Specific Courses. All courses are ASNT compliant and are taught by Level III Infraspection Institute Certified Infrared Thermographers® each having over 20 years experience. For more information or to register for a course call us at 609-239-4788 or visit us online at Distance Learning offered by Infraspection Institute. Maintenance departments face many challenges. One of the toughest challenges is securing adequate funding when money is tight. In this Tip, we discuss several ways to make sure you get the biggest bang for your maintenance buck. Companies are always on the lookout for ways to improve the bottom line. Reducing costs during an economic downturn has a long history; however, one must be careful which costs are reduced. Those who do not appreciate the value of a maintenance program often seek to reduce expenditures by indiscriminately slashing the company’s maintenance budget. A directive to reduce maintenance costs need not spell disaster. In fact, it can provide an opportunity to improve program performance by reviewing how maintenance dollars are spent and the value provided by various activities. When times are lean, the following areas can provide opportunities for improvement. Lastly, be certain to communicate the function and importance of maintenance and to all parties involved. Bad times are always followed by better times and it is important to ensure that companies emerge with a strong infrastructure, a solid workforce, and a reputation for delivering quality products or services intact. Designing and maintaining an effective infrared inspection program is one of several best practices covered in the Infraspection Institute Level III Certified Infrared Thermographer® training course. For more information, including course locations and dates, please call 609-239-4788 or visit www.infraspection.com. Additional articles on this subject are available from Maintenance Technology Magazine. Emissivity refers to an object’s ability to radiate infrared energy. Because infrared instruments measure radiant energy, it is imperative for a thermographer to understand emissivity and how it can vary. All objects above 0 Kelvin radiate infrared energy. The amount of energy radiated is dependent upon an object’s temperature and emittance. Increases in temperature and/or emittance will increase the amount of infrared energy radiated. Wavelength – For most objects, emissivity varies with wavelength. Although thermographers frequently obtain emittance values from published tables, this practice can introduce significant temperature measurement errors since emittance tables cannot account for several of the above factors. Because of this, calculating emittance with one’s thermal imager will help to ensure measurement accuracy. A simple procedure for calculating emittance may be found in the Standard for Measuring and Compensating for Emittance Using Infrared Imaging Radiometers available from Infraspection Institute. For more information or to place an order, call 609-239-4788 or visit us online at www.infraspection.com. The perpetual question among those using radiometric equipment is, “What emittance value should I use?” In this Tip, we address several options for providing emittance values. Emittance is a numerical value between 0 and 1.0 indicating an object’s relative ability to radiate infrared energy. Most radiometers allow the user to input emittance values into the radiometer’s computer. Utilizing correct emittance values is imperative for accurate non-contact temperature measurements. When determining emittance values for a target, there are five accepted ways to obtain an emittance value. These methods are listed below in order of increasing complexity and accuracy. Use Emittance Tables. Be certain to use tables that match your radiometers spectral response and your target’s temperature. Estimate Emittance. Choose representative sample and test for emittance value. Use these values whenever similar object is encountered in the future. Modify Surface to a Known Emittance Value. Use tape, paint, or powder with known E. Prior to modifying any surface, be certain it is safe to do so. Measure Emittance Value. Use subject radiometer to measure target E value. This practice is preferred as it provides the most accurate emittance values. The procedure for measuring emittance values is described in detail in the Standard for Measuring and Compensating for Emittance Using Infrared Imaging Radiometers available from Infraspection Institute. For more information or to order a copy, call 609-239-4788 or visit us online at www.infraspection.com. Utilizing correct emittance values is imperative for accurate non-contact temperature measurements. Knowing how to accurately calculate emittance values can help to ensure the accuracy of infrared temperature measurements. Although thermographers frequently obtain emittance values from published tables, this practice can introduce significant errors. Following the procedure listed below, it is possible to accurately calculate the E value of an object. Without moving imager, adjust E control until observed temperature matches value obtained in Step 4 above. The displayed E value is the Emittance value for this target with this imaging radiometer. For greatest accuracy, repeat above three times and average the results. Note: This procedure requires contact with the object being measured. Be certain to observe all necessary safety precautions prior to making contact with target. The above procedure is described in detail in the Standard for Measuring and Compensating for Emittance Using Infrared Imaging Radiometers available from Infraspection Institute. For more information or to order a copy, call 609-239-4788 or visit us online at www.infraspection.com. 1. Acquire and use a graduated set of collection letters for your delinquent accounts. Sample collection letters are readily and freely available on the internet, starting with a gentle reminder and increasing in impatience until the matter must be referred out to an attorney. Copy your lawyer with your final collection letter. Many times, a cc: line on the bottom of the letter is all it takes to convince your debtor that he’s had his last warning. Don’t forget to actually send the copy. 2. Early on, a telephone call should be made to catch any mistakes in the system, such as wrong addresses or accounting, and to find out if there is an acceptable reason for the delay in payment. Most people pay their debts unless something prevents them. You may be willing to accommodate their problem for a defined period. 3. Don’t forget to provide in your contract or purchase order for the recovery of attorneys’ fees in the event you have to sue. Most times, the thought of picking up the other side’s legal bills is enough to prevent delinquency all by itself. Remember, however, that unless the customer signs the contract, the attorneys’ fees clause will probably be worthless. 4. Keep copies of the checks you receive. In the event you need to sue to collect on a debt, the information found on a check will help you quickly locate and levy on the account. A bank levy is the easiest way to get real dollars to satisfy your judgment. 5. Discount your expectations. Collection agencies and attorneys don’t work for free, so compromise may be your best course. Figure on backing down to a sum which approximates your likeliest recovery less the expected costs to get there. When you’ve settled on a number you won’t walk away from, remember that terms of payment on time are still negotiable. That’s why they call them lump sums – installments are just easier to swallow. An age-old challenge for thermographers is the ability to annotate or mark objects to make them easier to identify in recorded imagery. One possible solution is to mark targets with an ink pen with low emittance ink. Many thermographers have long sought ways to mark targets in such a fashion that numbers or text can clearly be seen with a thermal imager. Over time, some thermographers have used paints with emittances that contrast sharply with the objects being marked. In these cases, text and/or numbers painted on the target are clearly visible within resulting thermal imagery and recorded thermograms. Recently some thermographers have reported good results in utilizing a Sharpie permanent felt-tip marker in silver color. The low emittance of the metallic ink contrasts markedly with high emittance targets allowing annotations to clearly appear within thermal images. In many cases, the silver ink can also be clearly seen in daylight images as well. An example can be seen below. One should be aware that Sharpie markers are permanent unless the ink is applied to a removable material such as tape or labels affixed to the target. Prior to marking any target, be certain it is safe to do so and that marking will not permanently damage the target. For more information on thermographer training and certification or to obtain a copy of the Guideline for Infrared Inspections of Electrical and Mechanical Systems, call Infraspection Institute at 609-239-4788 or visit us online at wwww.infraspection.com.